Wet Barrel Fire Hydrant (FIREFLO C503) are in accordance with the AWWA C503 standard. 2. 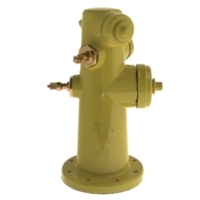 Hydrant barrel is of high strength ductile iron, ASTM A536, Grade 65-45-12. 3. 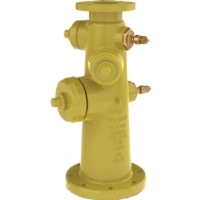 Rated working pressure of 250 psi at 33° F to 126° F.
4. 6” Flanged inlet connection to AWWA C110/ANSI B16.1, Class 125 drilling pattern. 5. Stems are blow-out proof and constructed of optional heavy duty silicon bronze or stainless steel. 6. Each valve assembly is furnished with an extra large volume rubber seat for superior flow and sealing performance. 7. Corrosion protection is accomplished by special epoxy coating, interior and exterior. 8. All nozzles are removable with a wide range of nozzle thread specifications.